Our neighbor's 17-year-old son qualified for and played in the US Open in early September. Jenson Brooksby won the USTA Boys' 18 National Championships in Kalamazoo, Michigan to secure a wild card spot at the U.S. Open. Jenson Brooksby has found success on the junior tennis circuit this year. Now the Carmichael teenager will look to excel on a much bigger stage. Brooksby will face John Millman in the opening round of the U.S. Open next week in New York. The draw for the final Grand Slam event of the year was announced Thursday. 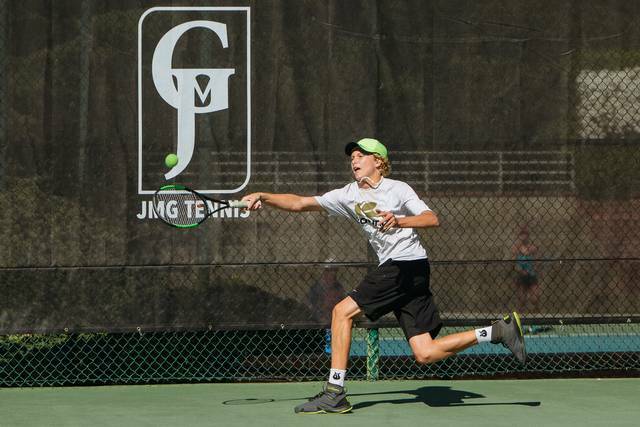 The 17-year-old, who is coached by Joseph Gilbert at the JMG Tennis Academy, secured a wild card in the tournament’s main draw earlier this month by winning the USTA Boys’ 18 National Championships in Kalamazoo, Mich.
Brooksby also won the Easter Bowl in Indian Wells in April. Gilbert calls Brooksby’s playing style consistent and skilled — something he needs now as the 6-foot-2, 140-pound teen gains experience and works on his power. Gilbert has coached Brooksby for “about 10 years.” They met when Brooksby was 4 years old. “I used to give his parents private tennis lessons before I started coaching him,” Gilbert said. Brooksby will face the world’s 54th-ranked player in Millman, a 12-year pro who has experience in all four majors but hasn’t won one. But Gilbert won’t be upset with a loss. That experience includes being around professionals and taking advantage of the perks that come along with playing a Grand Slam event, such as massages, physical therapy and the meals offered to the players. “These are all amazing things for a 17-year-old,” Gilbert said. Brooksby isn’t the only player out of JMG competing at the Billie Jean King National Tennis Center. Collin Altamirano, also coached by Gilbert, can make the main draw with one more victory in qualifying. He defeated Tomislav Brkić 6-2, 6-0 Wednesday and beat Ivo Karlović 7-5, 6-4 on Thursday. He will face Lorenzo Sonego on Friday.